This weekend my parents came to visit and brought me an extensive amount of care packages (I have been living off cookies). My dad had recently been to Europe and brought me back cookies from Switzerland. 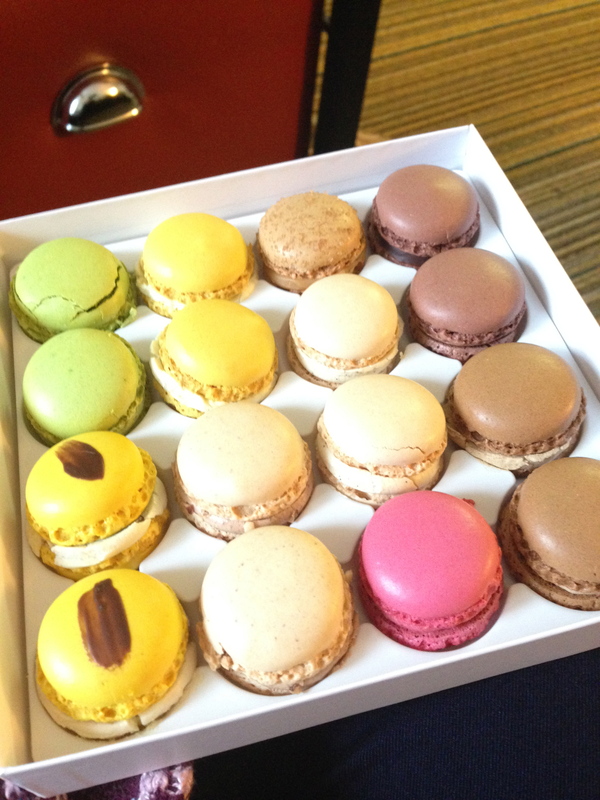 These cookies are called luxemburgerli and are similar to French macaroons. However they differ in their size and flavor. However, just like macaroons they are delicious! Switzerland is unique in its cuisine for it is not just its own but a combination of many different types. 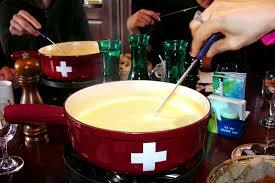 Traditional food from Switzerland is a combination of French, German and Italian cuisine. However there are still some foods classified as “Swiss”. Cheese and chocolate are regarded as traditional food to the area of Switzerland. The popular swiss cheeses are Emmental cheese,Gruyère, Vacherin, and Appenzeller and are served in dishes such as fondue and raclette. Other popular regional Switzerland dishes are torts and quiches. Another popular traditional Swiss item is cervelat, which is the national sausage. The French region of Swiss cuisine has many different popular recipes and also influences on Swiss food itself. A section called the Canton of Vaud is known for the dish Papet vaudois which is made of leeks, potatoes, and cabbage sausage. Two popular pastries also come out of this region and they are carac (a shortcrust pastry with chocolate) and meringue (made with thick cream). The German part of Switzerland also has many distinct recipes. These include some specialty breads, including Zopf which is typically only consumed on Sundays. Probably the most popular dish from the German region is Rösti. This is a simple dish which is quite similar to hash browns. It is sometimes referred to as the Rösti ditch indicating the imaginary demarcation line between the German side and French side of Switzerland but is eaten by both sides. Another nationality represented in the Swiss cuisine is Italian food, especially pastas and pizza. Ticino, the southern most part of Switzerland, is the region most associated with Italian food. Dishes popular here are polenta, pizzocherri, and saffron risotto. Nestle―the world’s largest food and beverage company―has its headquarters in Vevey. The first bar of chocolate was produced here in the year 1819 by François-Louis Cailler. That type of bread to number of people ratio is open! Cheese, chocolate, and pastries is a pretty awesome trifecta to be at the center of a culture’s cuisine. I hadn’t realized how much influence Switzerland has had from all of the nations surrounding it. Over break, I had a connecting flight in Zurich and thought that I’d do well with the language at the airport, because I took five years of French in high school. I was surprised to see that everything was German and not the French that I was expecting. It’s interesting how much cultures meld together in Europe, which I guess can be found even in foods.